Cross-examination is a skill that every trial lawyer hopes to master, but few do. In the new book, Excellence in Cross Examination, published by Thomson Reuters, two giants of the trial bar, F. Lee Bailey and Judge Kenneth J. Fishman, share their insights and lessons on how to excel in cross-examination. 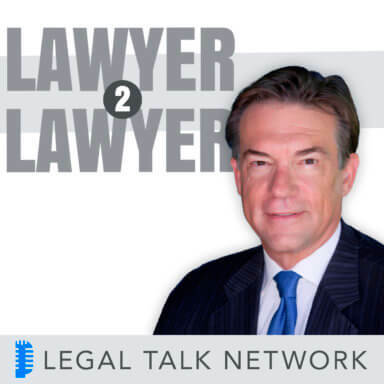 In this edition of Lawyer2Lawyer, host Bob Ambrogi invites Bailey and Fishman to discuss their newest book and the key skills lawyers need to be effective in cross. Having represented high-profile names such as O.J. Simpson, Dr. Sam Sheppard, and Captain Ernest Medina, F. Lee Bailey is known for his successful career as a trial lawyer in criminal and civil cases. He has been a licensed attorney for more than 50 years, authored and co-authored 21 books, and is a licensed private investigator. In addition to his legal career, he has worked as a designated naval aviator with the U.S. Marine Corps. The Honorable Kenneth J. Fishman was a practicing attorney for nearly 30 years before he moved to the bench. This marks his tenth year as an associate justice for the Massachusetts Superior Court. A former law partner with Bailey, he is a frequent speaker and lecturer for the Massachusetts Association of Criminal Defense Lawyers, National Association of Criminal Defense Lawyers, and The Massachusetts Bar Institute.